Biblically speaking, nothing seems to piss God off more than members of the faithful who refuse to heed prophecies. For example, the prophet Jeremiah, who continued to warn his fellow Israelites that God would punish them if they didn't "turn away from their sins" until he was completely ignored, predicted that if they didn't heed his warnings, the Jews would be scattered from their homeland and persecuted. As you must know, the Jews continued to ignore Jeremiah and, sure enough, they were scattered from their homeland and persecuted. Repeatedly. Of course, it is popular to imagine that prophets no longer exist; but they do—only we now call them "scientists". Like the prophets of old, some make accurate predictions and some don't; and we tend to crucify (in a metaphorical sense) the ones who don't. The others, like Jeremiah, are merely ridiculed until their predictions come true; and then it's too late to do anything about it. 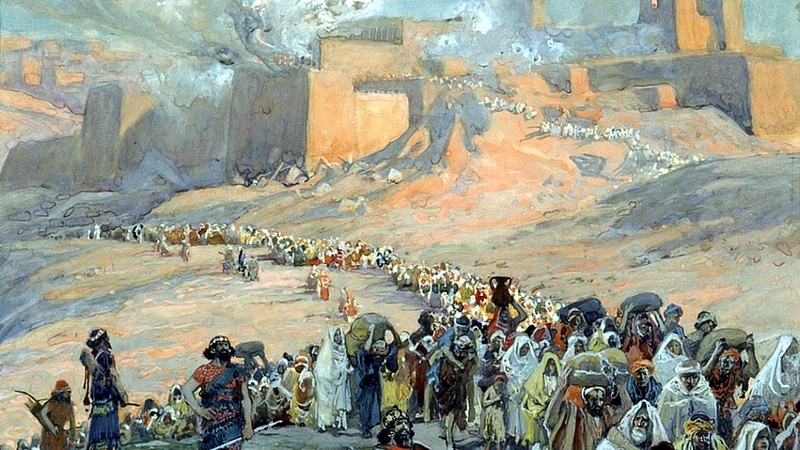 Despite his reputation as an accurate if somewhat cranky prophet, Jeremiah didn't really need lessons from Shirley Maclaine to predict that the Jews would be scattered. He lived about 2600 years ago, during the reigns of Josiah, Jehoiakin, Jehoiachin, and Zedekiah. (In those days, one of the toughest requirements of being a prophet was managing to pronounce the rulers' names.) Jeremiah lived through the invasions by the Babylonian armies, the deportations and slaughter of Jews living in Jerusalem, and the destruction of the Temple. At that time, surrounded by powerful and greedy empires, there was no sign of things changing any time soon. Jeremiah 10:2-4: "Thus saith the LORD, Learn not the way of the heathen, and be not dismayed at the signs of heaven; for the heathen are dismayed at them. For the customs of the people are vain: for one cutteth a tree out of the forest, the work of the hands of the workman, with the axe. They deck it with silver and with gold; they fasten it with nails and with hammers, that it move not." (KJV). Of course, there weren't actually Christmas trees back then before the birth of he who is known as the Christ. 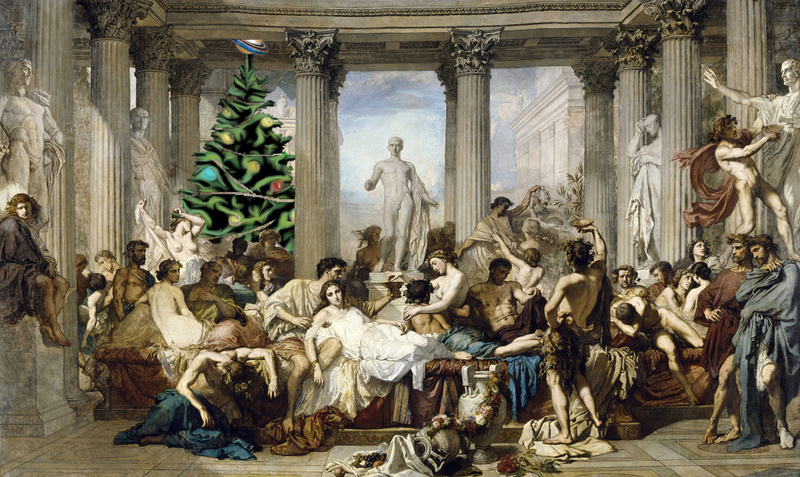 These decorated trees may not have even been brought into the home (though half a millennium later the Romans did bring them in for their wintertime celebration of Saturnalia, inspiring early Christians to do the same, much to the consternation of early Christian leader and prolific writer Tertullian). My point, though, is that the destruction of trees for decorative purposes is once again a factor in predictions of doom. Currently, an estimated 1.8 million acres of rainforest are destroyed per year. Each tree in a rainforest converts the greenhouse gas carbon dioxide back into oxygen. For every tree that is burnt or cut down (whether decorated or not), the carbon dioxide spewed out by a car or a power company smokestack or a cigarette or by Brittany Spears' breath simply floats around, unconverted, where it hangs onto the heat from the sun and makes Phoenix, Arizona, just a little hotter. You don't have to be a scientist to understand the problem. You only have to have gotten into your car on a hot day when the windows were rolled up. It may have been hot outside, but inside it's blistering. Why? Obviously the heat came in the windows. Why didn't it just leave? The problem is, heat does not, in fact, come in windows. Windows are made of glass, and glass is an excellent insulator (which is why we make home insulation out of fibers of it). But windows are clear, and light from outside easily passes through them. That light, containing the Sun's energy, falls upon the fabrics, plastics and other materials in the car. Unless those materials are mirror shiny, they absorb some of that light and, in so doing, warm up. Warm or hot materials radiate heat, as you know if you've ever held your hands up to a warmed burner on your stove, or a hot iron. What you can't see—because your eyes aren't made to—is that the radiation is in a color called infra-red. "Infra" is Greek for "below". Infra-red is a color below red; that is, its wavelength makes it compare to red, as red compares to orange. Our eyes are simply not designed to see this color, the same as we can't see X-rays or radio waves. But it's real, nonetheless. And glass, while clear to our eyes, is opaque to infra-red. So all that heat is trapped in the car, where it builds and builds until you finally open the door and burn your hands on the steering wheel. 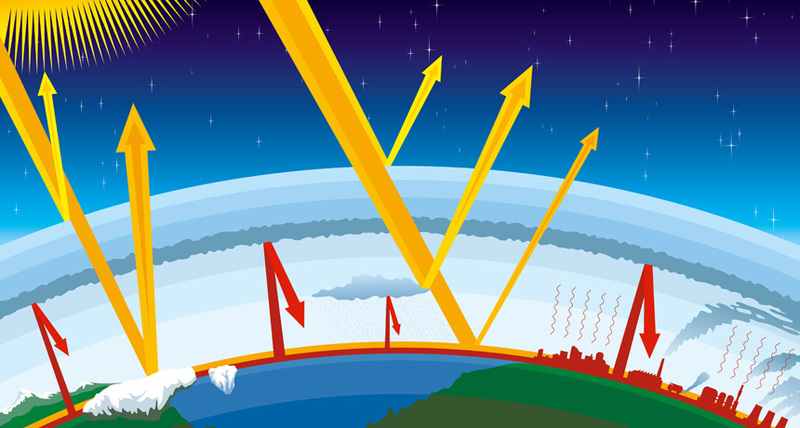 Our atmosphere is like a giant window wrapped around the entire Earth. As with your car, the Sun's light pours through, warming the Earth. With the proper balance of gases in the atmosphere, just enough infra-red flows back out to keep us at the Goldilocks temperature: Not too hot, not too cold, just right. But carbon dioxide (along with some other gases) is, like glass, opaque to infra-red. With too much of it in the atmosphere, Earth warms up exactly like a car interior with the windows up. For thousands of years, Earth has had a balance of carbon dioxide that gave us a stable climate, primarily thanks to the Gulf Stream, an oceanic conveyor belt that brings warmth from the equator to the Arctic Ocean, and coolness from the North Pole to the equator. Without the Gulf Stream, climates would be far more extreme than they have been, with fiercer summers and colder winters. The Gulf Stream requires a certain degree of saltiness in the ocean in order to work. The initial inconvenience of "global warming" is that the glaciers melt, pouring water into the oceans and thus raising the sea level so that coastal cities like New York and Miami find themselves underwater (not too mention entire island nations like Micronesia). But the real danger in global warming isn't that Earth will get too hot; it's that, when enough glaciers and ice sheets melt, the sea won't be salty enough to support the Gulf Stream. And if the Gulf Stream shuts down (as it did at the end of the Pleistocene Epoch, thanks to a global warming produced by a nearby supernova), climate extremes once again coat the northern continents with glaciers, until so much water has been drawn from the seas that they once again become salty enough to re-start the Gulf Stream (a process that takes about 10,000 years). Meanwhile, the sea level drops about 200 feet, exposing far more land than was flooded during the first part of the cycle. The newly exposed land is very fertile and, over the next few thousand years, people move onto it, build new cities, and eventually forget it was ever any other way. With all that moisture locked up in ice, the part of the world that isn't covered by glaciers isn't that great to live in, either. Basically a dry spell hits that brings famine and misery to the populations that didn't freeze to death. The Biblical Noah (copied from a pre-Sumerian folk hero named Ziasudra) got his name, which means "respite", from parents who hoped for some reason that he might signal the end of the drought. Bill Cosby, in his famous comedy skit, envisioned Noah's next door neighbor begging for a hint as to why Noah was building an ark. "You want a hint?" Noah teases. The last ice age may have ended when a meteorite crashed into (what is now) Hudson's Bay, creating a global wall of water that few survived. Or perhaps, as Edgar Cayce maintains, a war between Atlantis and China resulted in misdirected energy beams that flash-evaporated much of the North American ice sheet, creating the fossil Lake Agassiz in its wake. Whatever happened, the jolt also kick-started the Gulf Stream, and Earth settled into its current, comfortable, climate. Deduction tells us that burning gasoline made from oils that are carbon compounds trapped from millions of years ago, releases into the atmosphere of today fossil carbon dioxide that wouldn't otherwise be there. Our current place in the cycle can be seen as well as deduced. Satellite images of the Arctic Ocean, which just a few years ago was covered by ice, reveal that the process is well underway. Greenland's ice sheet melted nearly 19 billion tons more than the previous high mark, and the volume of Arctic sea ice at summer's end was half what it was just four years earlier, according to new NASA satellite data obtained by The Associated Press. "The Arctic is screaming," said Mark Serreze, senior scientist at the government's snow and ice data center in Boulder, Colo. Just last year, two top scientists surprised their colleagues by projecting that the Arctic sea ice was melting so rapidly that it could disappear entirely by the summer of 2040. 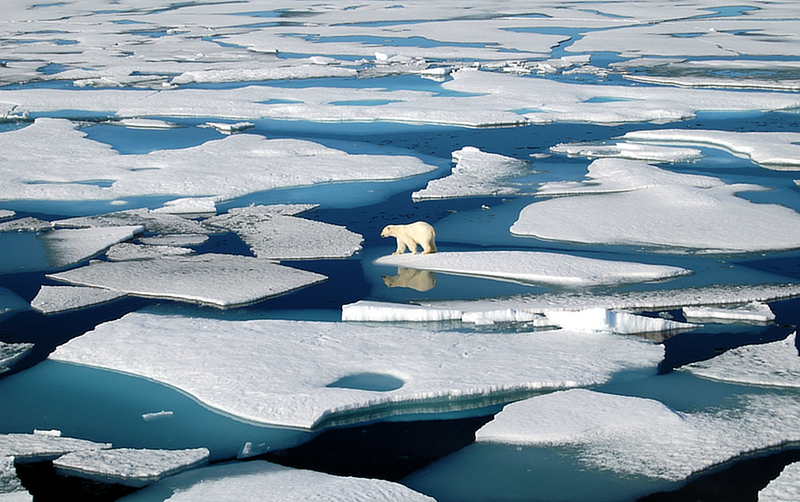 This week, after reviewing his own new data, NASA climate scientist Jay Zwally said: "At this rate, the Arctic Ocean could be nearly ice-free at the end of summer by 2012, much faster than previous predictions." The choice of 2012 as a target year is of specific significance, as that is also the year the ancient Mayan Calendar ends. Tradition holds that the Mayans (or their ancestors) were technologically advanced and understood things about the cycles of the Earth that led them to believe an "age" would end in the year 2012. If an age ends, another must surely begin. Could it be…an ice age? Of course, geologic periods do not begin or end on a certain date; it takes centuries for the results to become evident. One thing is certain: As the Book of Jeremiah makes clear, refusing to heed warnings is no protection from the Wrath of God, or the coming of the inevitable.